Using 2-chloro-trityl chloride resin as a solid phase carrier, a linear peptide was synthesized by Fmoc solid phase synthesis followed by liquid phase cyclization. After separation and purification by high-performance liquid chromatography (HPLC), cyclic octapeptide samoamide A was prepared. The synthesis yield was 54.5%. The structure of cyclic octapeptide samoamide A was characterized by electrospray ionization–mass spectrometry (ESI-MS) and nuclear magnetic resonance (NMR) spectrometry. The biological activity was evaluated by the CCK-8 assay and DPP4 enzyme activity inhibition assay. This compound exhibited high antitumor activity. Using samoamide A as a lead compound, eight cyclic octapeptide samoamide A derivatives (a, b, c, d, e, f, g, and h) were designed and synthesized using the alanine scanning method. The molecular weight and chemical structure of these derivatives were verified by ESI-MS and NMR, and the antitumor activity of the derivatives was analyzed. 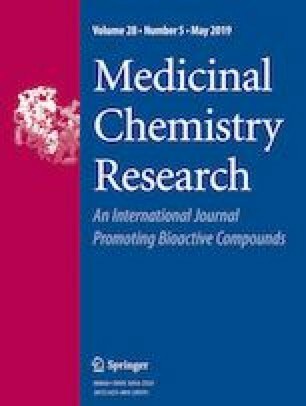 The antitumor activity of compound f was similar to that of samoamide A, and its replacement site is the non-active site of samoamide A, providing a theoretical basis for further modification and transformation of samoamide A. The online version of this article ( https://doi.org/10.1007/s00044-019-02333-5) contains supplementary material, which is available to authorized users. This work was supported by the National Natural Science Foundation of China (NSFC) [grant number 31671797], Natural Science Foundation of Anhui University [grant number KJ2017A123, KJ2018A0117 and KZ00217058], Anhui Province Major Scientific and Technological Projects [grant number17030701014], Anhui Natural Science Foundation [grant number1808085QC85], and the Youth Talent Support Program of Anhui Polytechnic University [grant number 2016BJRRC006]. All authors listed have contributed to the conception, design, gathering, analysis or interpretation of data and have contributed to the writing and intellectual content of the article. All authors gave informed consent to the submission of this manuscript.